GLENDALE, Ariz. — The overtime lasted all of 65 seconds. The Cardinals won the overtime coin toss and took the ball. On the first play, Arizona QB Carson Palmer scrambled out of trouble and threw back across the field to WR Larry Fitzgerald, who weaved and darted his way for 75 yards in all, to the Green Bay 5-yard line. On second-and-goal, Palmer threw a shovel pass to Fitzgerald for a 5-yard TD, and the Cardinals won, 26-20, ending the Packers’ season. For the game, Fitzgerald finished with eight catches for 176 yards as Palmer completed 25 of 41 passes for 349 yards with three TDs and two INTs. 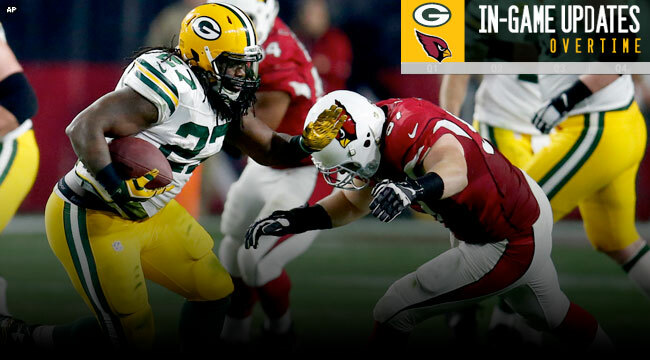 Packers QB Aaron Rodgers was 24-of-44 for 261 yards with two TDs and one INT.